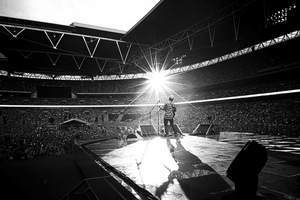 NEW YORK, NY--(Marketwired - Jul 24, 2015) - Atlantic Recording artist Ed Sheeran gives television audiences a front row seat to his sold out summer headlining shows at London's Wembley Stadium in a one-hour NBC special, titled "Ed Sheeran - Live at Wembley Stadium," airing Sunday, August 16 (8:00p.m. ET). "Ed Sheeran - Live at Wembley Stadium" shows the global superstar performing his biggest hits, including his breakthrough Grammy-nominated single "The A Team" and worldwide #1 smash "Thinking Out Loud," as well as a one-of-a-kind duet with Sir Elton John. "Ed Sheeran - Live at Wembley Stadium" also features unseen documentary footage with exclusive access that captures the build up around Ed's historic, record-breaking shows at the iconic venue, where he played to 240,000 fans across three memorable, sold-out nights. "I can't say that performing at Wembley Stadium was a 'dream come true,' because I honestly thought it was out of reach and didn't think it was possible," said Sheeran. "But with each tour, the venues continued to grow and it became something of a challenge to see how far we could take it, how big we could go and still deliver a show that connected with the entire audience. It really doesn't get any bigger than Wembley in my mind and it was an honour to join the select few that have headlined there. It's definitely a personal milestone and I'm so glad to share this special moment with all of my fans." Sheeran is a six-time Grammy-nominated, multiplatinum singer-songwriter. At only 24 years old, the British artist has already become a global phenomenon. His latest album "x" (pronounced multiply) has gone to #1 in 14 countries around the world, including the United States and his native United Kingdom, where it was both the biggest and fastest selling album of 2014. "x" was nominated for Album of the Year at the 57th Annual GRAMMY Awards, and features a trio of platinum hits -- "Sing," "Don't," and his chart topping smash "Thinking Out Loud" -- as well as his latest single "Photograph." An acclaimed live performer, Sheeran has played countless sold-out shows all over the globe, including a three-night stand at New York City's Madison Square Garden and four nights at London's O2 Arena. His current worldwide tour returns to North America this fall, highlighted by his biggest stateside show yet, taking place at Gillette Stadium in Foxborough, MA, on September 25. Ed Sheeran - Live at Wembley Stadium, is produced by JA Digital for Atlantic Records/Warner Music UK. Producers are Jim Parsons, Julie Jakobek and Stefan Demetriou. Executive producers are Stuart Camp and Kevin Weaver. Paul Dugdale directs. For more information, please visit http://www.nbcumv.com/mediavillage/ and http://press.atlanticrecords.com/ed-sheeran/.